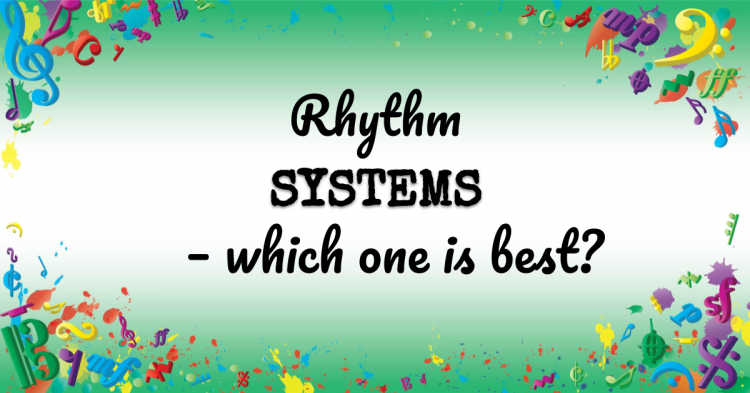 VMT028: Rhythm systems – which one is best? Confused by all the different rhythm systems out there? Ta, ti, du and 1 2 3 4? Let me talk you through them in this episode so you can get them straight and figure out what might be best for your students. Welcome to Episode 28 of the vibrant music teaching podcast. 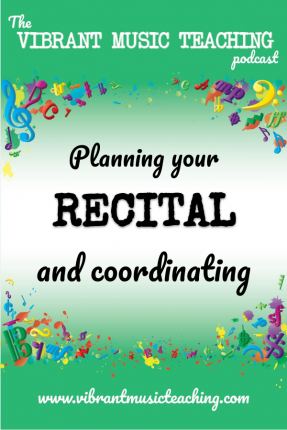 I’m Nicola Cantan and in this episode I’ll take you through some different rhythm systems so that you can decide which one is right for you and your students. Hi there beautiful teachers welcome back to another episode of the vibrant music teaching podcast it’s great to have you here again. And if you’re joining me for the first time you’re very welcome and I hope you enjoy the show. Today we’re talking about rhythm. Rhythm is so so important for our students if they’re going to sound really really good and we all know this because we’ve all had students who have poor rhythm. But often students don’t realize quite how important it is. And often we don’t spend enough time on it in the lesson so we don’t show them how important it is. And if you don’t believe rhythm is important or you students don’t believe it then I want you to try this little exercise. Now I’ve got this from somewhere I believe it was on Tim Thompson’s podcast but I can’t remember who the guest was. He said there’s over you’re listening and you came up with this idea. Let me know. But I think it might be one that’s been floating around the blogosphere for a while anyway. So this is the idea. You take a familiar piece of familiar tune normally a folk song will work really well. And what you do is play it first with terrible rhythm completely not what it should be at all. OK just completely change it. This works great with any familiar folk song and play it for your student or for yourself if you’re proving this to yourself and see if they can recognize it. See if it sounds good to them and then play the song with good rhythm perfect rhythm but some wrong notes thrown in like just play the note beside the note or completely the wrong note and a few different spots. Most students and certainly most of us will recognize it much better when it has a correct rhythm than when it has all the correct notes. So that’s just a little preparation exercise if you need to convince especially a stubborn teen of the importance of playing with good rhythm. But I’m going to presume that you know it’s important because I’m sure you do. Now there are lots of different ways to teach rhythm and there are so many different opinions on this and I don’t want to debate which one is best. I am going to tell you my favorite to use at the end of the episode but I know all of the debates and the sort of benefits of each one and all of these things and that’s fine. What I want to do today is just take you through the different things so you know what the options are and maybe encourage you to try something you haven’t tried before. Because here’s the thing. Whatever you grow up with using whatever your teacher used is most likely what you started with when you started teaching. That’s the case for a lot of teachers anyway. And it’s a case with lots of things right. So whatever way we learn to read note we often it that way whatever method book we started and we might start with that when we start teaching our students. And just because it worked for us it doesn’t mean it will work for most students. That’s true. So many things just because it worked for us doesn’t mean it will work for all of our students and it probably doesn’t mean it will work for most students because let’s face it we were the exception when you took lessons as a kid. Lots of other students took lessons as well and most of them quit. That’s the fact. Most of them quit. And you made it all the way through that system. So whenever I’m considering anything like this how I teach not reading how I teach How I balance improvisation and reading and how I integrate exams and the way I teach practice and the way I teach rhythm and everything I like to come back to that fact I made it through that system because I’m a little bit unusual. I was able to sit on a bench for thirty or forty five minutes or an hour and concentrate on the task at hand. And I was able to go home and do that in my practice as well maybe not for quite as long but I did some of it and I was quite happy sitting alone in a room and working on these things. And I have quite a mathematical mind. So I didn’t mind counting that wasn’t a problem but it’s not necessarily the best solution for all students and for most students just one system is not always the best solution no matter which one we choose. So I want you to consider these different rhythm solutions today and maybe try one you haven’t tried before. That’s really what I want to encourage you to do with today’s episode. So let’s go through them first of all we have Kodaly. OK. So Kodaly. If you’re not familiar with the term you might still be familiar with the actual Kodály syllables. Now we talked a bit more about Kodaly in a recent episode. So if you want to go back just a couple of episodes and listen to 26 and 27 that’s where I talked about Kodaly and then solfa which is associated with Kodály. But also he has a rhythm system where the method has the rhythms as depending on what where you want to think about it. So the Kodaly system is Ta and Titi so Ta are crutches or a quarter note Titi is two quavers and it goes on from there. So I would be a M. T T. And then there are differing systems from there. Tika tika is what I use or territory for semi quavers et cetera et cetera. So these are different vocalizations they are based on the type of note that is in front of you. They are not based on where it is in the bar or what the time signature is or anything like that. They are just individual to each note with me so far. So that’s a Kodály system. And there are various variations on that as well such as I think it’s called tackled. DME is a very similar system in that it works on specific notes the sounds are just some of them are different right. But that’s just a variation in my opinion. OK. Then we have Gordon now the Gordon system. I’m going to defer to the experts here. If anyone wants to correct me on any of this that’s totally fine. It is not my primary rhythm system but I do understand the basics of it. So if you’re not familiar with Edwin Gordon this is music learning theory and in this system it’s a little bit different because it’s not based on just the note value that’s in front of you. It’s also based on where it is and what it’s doing. So macro beats are due and then when it’s subdivided and do its due D or do day I’m not sure about that pronunciation there. And then if you divide it again it’s due to data. So you it’s based on what is the main beat and how many times it’s subdivided so do is always at the start of the beat and if it’s the whole beat then you just say do. So this does change based on the meter the time signature and it’s sort of in a way somewhere between Kodály and metric counting which is what I’m going to talk about next. So that’s Gordon it’s again it’s easier to vocalize like today is but it’s based on the meter in the time signature and then metric counting is more than likely what you grew up with. It’s what I grew up with. So that’s where Ukraine counting across the bar. So if it’s in four four we count one two three four. And if we need to subdivide we use and one and two and three and four on or if it’s in 6 8 you count one two three four five six etc. metric ending is useful because it tells you where you are in each bar or measure and you can easily emphasize the strong beats and subdivide what metric counting doesn’t do well is make it easy to say the rhythm. I think that’s its big failing. And it also isn’t that easy for a beginner to understand especially a young beginner because at some stage you have to talk unless you just teach it purely by rote and just repeated enough times that they get what’s going on. You have to talk about you know you’re dividing this beast and therefore you have an and etc. You have to explain that somehow. So it does get a little bit more intellectual and that’s one of the reasons I’ll talk about in a minute why I don’t introduce metric counting in the beginning but I believe that all students should learn to use metric counting because it’s the most ubiquitous system and because it is useful for understanding how notes fit into each bar or measure then we have other sort of variations on these which would be unit counting some beginner method books young beginner method books start with unit counting such as my first piano adventure starts this way. So crutches or quarter notes are just dead as one and then minimize or half notes are sent as one to no matter where they are in the bar. So that in a way similar to the way Kodaly works except it’s just numbers. And then I know some teachers also use words such as Walk walk walk walk running running walk walk and things like that or fruits or all sorts of different words that people have those all really fit in the same categories could I. Because they’re based on what the note is not where it is in the bar and not how it’s functioning in that time signature just it on its own. So those are the basic systems that we have to work with. Now what’s my favorite I’ve already alluded to this but I use Kodály with my beginner and young beginner students especially and then we transition over to metric counting and still use both systems going forward. So my version of could I sort of modified in a random ish way I mean it makes the most sense to me but it’s not any particular system. I like the way Ghana safari uses type 2 and Type 2 3 4 instead of tar and tab for minimums and semi rings so I use that but I don’t do Tati Tati which is what they say for quavers I use t t t t because I’m so used to it and also because a lot of schools here if they teach music today is the main sort of philosophy or methodology that is used in schools here. It’s the most popular by far. We don’t have much of say Dal crows or other systems like that. So if students do music in school they normally talking to Titi and I’d keep that as as similar as I can in my studio for this because there’s really no point. I’m learning a different system and because I’m going to move to metric counting later or integrated as well I don’t feel the need to emphasize the main beat by saying Tati instead of tat Titi. OK so that’s how I use the coding system and I start that with all young beginners and use it say for the first year or two depending on their age exclusively and then transition to metric counting. Still using today’s syllables when it makes more sense especially when there’s only one line going on you know there isn’t a case where you have to fit two hands together. That’s where metric counting really comes into its own and makes the most sense in terms of counting it coordinate you know figuring out the coordination but if they’re just using one hand or the other hand is just playing Sami briefs in every bar then there’s no reason really why we can’t use the coding syllables if it’s going to help them learn the rhythm of the piece and it’s gonna be more natural to them. So the reason I like using clear labels like this is we can say them. They’re easier to say. It’s really that simple. Which means we can march around while saying then we can clap them we can say them while we do rhythm instruments. We can sing them we can do all of these things that you just cannot do with numbers to the same extent. The other thing about using numbers from the beginning say if we were going to do unique counting and like I mentioned my first piano adventures does well that’s the same kind of system as could I but it is a little bit more difficult to say and it’s easier to confuse with other stuff if you’re talking about young beginners. OK I’m teaching a lot of kids starting with me at five and under. So you’re talking about young kids here and you’ve already got numbers for the finger numbers and you might start using numbers for other things as well. Like I start using them for when we’re harmonizing songs. If there is a place where I can take numbers ahead of it I want to do that. So there’s no reason to bring the numbers into this as well. Have another thing that’s numbers and is harder to say and feels less natural to me than just ty t t ty etc.. So that’s how I use it. But as I said I want to encourage you to mix it up a bit. Don’t use the same system you’ve always been using. Don’t use just one system. Try a new one the next time you have to teach semi quavers or sixteenth notes try using ti ka-ti ka. I promise you it’s so much easier to say than one end to me under or whatever you’ve been doing for those thus far. It’s way more instinctive. They can feel it better they can remember it better next time it’ll make more sense to them because that’s ti ka-ti ka versus the TV and it all fits together. So just try it it doesn’t have to be mind you try. Maybe you like the idea of the Gordon system and you’ve heard about it before and you thought you’d try it but you hit a stumbling block research it. Try using it. You just need to try these things with students so that you can start appreciating the value of each one and which one works best in different situations. So I hope has been help for you and has given you a quick overview. I’m gonna be talking more about rhythm in the coming weeks. Next week I’m going to talk about helping students who are really struggling with rhythm and what we can do to help those students along and help them catch up in terms of their rhythm skills if they fall behind the show notes for this episode will be at vibrantmusicteaching.com/28. That’s just the numbers 2 8. If you want to listen back again read the transcript or get any of the links that are relevant to today’s episode. And if you want to hear more about rhythm I have tons of stuff coming up. So as I said we are talking about rhythm for a few weeks here on the podcast and also on the blog. But I also have a brand new book out just today on Amazon. That’s going to be at vibrantmusicteaching.com/R5 excuse me that’s R5 for the non Irish people listening so vibrant music teaching dot com slash R5 add to take you straight that book on Amazon that is twenty five different rhythm exercises that you can do in five minutes or less with your students. It’s called Rhythm in five if you wanna do a search for it and I think it’s gonna be really really fantastic for you in your studios to make rhythm easier to integrate into your lesson and more fun and more interaction interactive. They’re all big movement activities and games that you can play with the minimum of other resources at your fingertips. And as I said just in a few minutes of lesson time. So that book is out now you can grab it right now. You can also join me for a webinar about this on Friday or Monday. So I mean due to this time Friday evening my time or Monday afternoon my time. So if you want the details on that the best thing to do is go to the show notes for this episode. Again that’s vibrant music teaching dot com slash 28 and you can get all the links there to all of this stuff. I hope you’ll be able to join me on at least one of those webinars live there at two different times to hopefully see you in your time zone. I’ve done my best to make everyone happy there and yeah if you fancy a book all about rhythm and rhythm drills and making your rhythm more fun in your lessons then go grab the book as well on Amazon hardcopy or Kindle whichever you prefer. Vibrant music teaching members can now get the rhythm and five PDA book Inside the library. Absolutely free to all members. So if you’re not a member and you fancy getting that one as part of your membership you can sign up now at VMT dot ninja and get instant access to that book and all the other fantastic resources inside the library. The above audio transcript of “VMT 28_Rhythm systems – which one is best.mp3” was transcribed by the best audio transcription service called Sonix. If you have to convert audio to text in 2019, then you should try Sonix. Transcribing audio files is painful. Sonix makes it fast, easy, and affordable. I love using Sonix to transcribe my audio files.